Wales recorded their biggest test win for nearly 17 years with a 10-try 65-0 drubbing of Hong Kong at Cardiff Arms Park. Wales scored 10 tries as they thrashed Hong Kong 65-0 at the Arms Park to record their second consecutive win of their autumn campaign. After last weekend's impressive victory over South Africa Wales were determined to keep the momentum going and they did so in emphatic fashion. Rowland Phillips' side were outstanding from start to finish with their visitors unable to cope with their physicality, pace and accuracy. 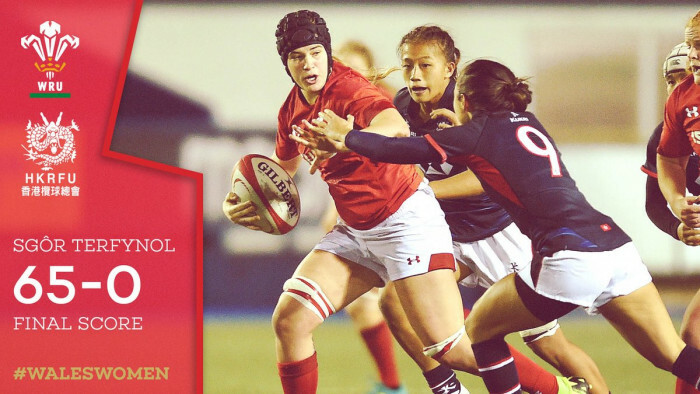 Wales' tries came courtesy of Jasmine Joyce, Bethan Lewis, Sioned Harries and Lisa Neumann who scored two apiece, while Gwen Crabb and Siwan Lillicrap also crossed the whitewash. On top of the tries Robyn Wilkins scored 15 points from the kicking tee. Wales started like a house on fire with Joyce showing her pace as she brushed off two tackles to run in unopposed for the opening try of the game. Their second try was launched inside their own half when Harries charged forward off the back of a driving lineout. The powerful No 8 offloaded to Alecs Donovan who put Neumann into space with the winger beating three defenders on the outside for the try. Wales kept the pressure on with Joyce grabbing her second try when she raced past two defenders to touch down under the cross bar. The hosts crossed for their fourth try when openside flanker Lewis powered her way over from short range following a period of sustained pressure. Lewis crossed for the second time in five minutes to move rampant Wales past the 40 point mark with some terrific interplay between backs and forwards. Full back Lauren Smyth was the architect of their next score as she made 40 metres before being hauled down. But the ball was quickly recycled with Donovan finding Wilkins before the outside half sent Harries over with a well-timed pass. Second-row Crabb crossed for her side's seventh try just before the interval to give Wales a 48-0 lead at half-time. Wales began the second half in the same fashion as they started the first by building sustained pressure on the Hong Kong try line. And after a series of powerful carries by the hosts outstanding No 8 Harries crashed over the line to complete a brace of tries. Left-wing Neumann crossed for her second after hitting a lovely inside line which cut the Hong Kong defence to ribbons. It was Lillicrap who barged her way over the try line for Wales' tenth try of the evening after a wonderful move involving both backs and forwards. 2' Pen Wilkins (3-0); 5' Try Joyce (8-0); 13' Try Neumann, Conv Wilkins (15-0); 22' Try Joyce, Conv Wilkins (22-0); 23' Try Lewis, Conv Wilkins (29-0); 26' Try Lewis (34-0); 30' Try Harries, Conv Wilkins (41-0), 36' Try Crabb, Conv Wilkins (48-0). Half-time: 48-0. Hong Kong: 1. LAU Nga-Wun, 2. Dr Karen SO (captain), 3. YIP Cho-kwan, 4. CHAN Ka-yan, 5. TSANG Ching-man, 6. PUN Wai-yan, 7. Maggie AU YEUNG, 8. Melody LI (vice captain), 9. Jessica HO, 10. CHENG Lok-tung, 11. CHONG Ka-yan, 12. Grace HOOD, 13. Natasha OLSON-THORNE (vice captain), 14. Jessica EDEN, 15. Stephanie CHAN, 16. Charlotte MYRANS, 17. Vincci LEUNG, 18. LAM Ka-wai, 19. Amber CHAN, 20. Winnie SIU, 21. SHAM Wai-sum, 22. Sarah LUCAS 23. LAU Sze-wa.